NYC folks-- see you at MoCCA Festival, April 7-8! If you're in the New York City area, come out to the MoCCA Arts Festival (Metropolitan West, 639 W. 49th St.) on Saturday, April 7th and Sunday, April 8th! I'll be a Guest of Honor for the festival, will be doing panels and signings, and will have some preview cards for Come Again as well. A portion of my current The Art Of MARCH: A Civil Rights Masterpiece exhibit (at Society Of Illustrators, 128 E. 63rd St.) will be on display at MoCCA as well-- check it out if you can! NYC-- MARCH art exhibit reception this Thursday 3/1! New York City folks-- see you this Thursday, March 1st for a public reception of a huge March art exhibit at the Society Of Illustrators (128 E. 63rd) from 6-9pm. 150 pages on two floors! The show will continue through June 30th, so swing by anytime if you can't make it this week. Thanks-- spread the word, and I hope to see you there! MARCH journals, postcard sets, and pin sets available! I'm not into licensed merchandise, but my collaborators and I are very impressed by the folks at Chronicle Books, and their push to design these bad boys to be inherently action-oriented. Stuff to carry your own concerns forward, organize, keep up the pressure, stay loud, stay together. *March 200-page hardcover journal w/ additional essays, excerpts from the trilogy, historical contexts, and handy contact-and-action points for your elected officials. *March 30-postcard set w/ even more essays, excerpts, and context. *March 2-pin set-- one emblazoned with the Edmund Pettus Bridge, the other reading "Good Trouble / Necessary Trouble". Anyway, these are $45 retail, so here they are a bit cheaper. Change will never come from commodifying activism-- but these are tools, as are the books themselves. I dig em. JOHN LEWIS AND "MARCH" ON ARTHUR! 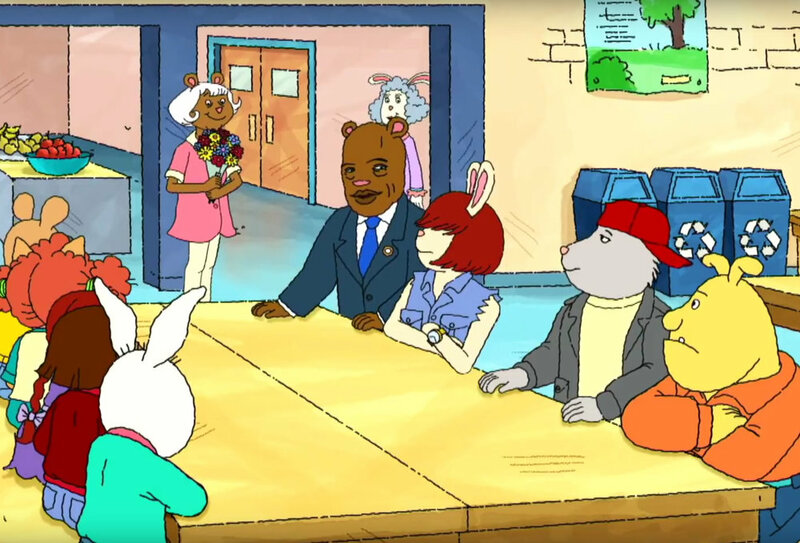 Check out the new Arthur episode, "Arthur Takes A Stand", in which the title character organizes school boycotts and sit-ins to protest unfair working conditions, along with a guest appearance by the man himself, John Lewis, and a shout-out to March! I'm so proud of this moment. We need to prepare our kids for the necessity of activism and risk. Can't wait to show the episode to my children! I'll see you on Thursday, March 1st for the opening reception of a massive March artwork exhibit at the Society Of Illustrators (128 E. 63rd St.)-- 7pm sounds about right. This show is co-curated by John Lind and Charles Brownstein, with accompanying text by Jonathan W. Gray. I'm really looking forward to it-- see you there! MARCH artwork exhibit at San Francisco's Cartoon Art Museum-- reception on Feb. 9th! If you're in the Bay Area, come to the Cartoon Art Museum (781 Beach St., San Francisco) on Friday, February 9th from 7-9 pm for the opening reception of a March original artwork exhibit! I'll be doing some combination of slideshow talk, discussion, Q&A, casual walking tour, and book signing along with snacks, slow jamz, and ponies. The event is free for museum members, and $10 for the public-- I look forward to seeing you there! MARCH discussions, slide show, and class visit in Ann Arbor on November 27th! If you're in Michigan, come to Ann Arbor tomorrow to meet John Lewis, Andrew Aydin, and I! First, I'll be doing a slideshow, group discussion, Q&A, and signing at the Ann Arbor Downtown Library (343 S. 5th Ave.) from 1:00-2:30 pm. The whole MARCH team will be doing a talk and Q&A at 7:00pm at Hill Auditorium (825 N. University Ave.), followed by a signing with all of us. THURS 7/20, 5-6 pm: Signing w/ Andrew Aydin at Top Shelf/IDW booth #2743. FRI 7/21, 10am-12pm: Signing w/ Andrew Aydin at Top Shelf/IDW booth #2743. FRI 7/21, 4:30-5:30 pm: "Into The Past: History & Comics" panel w/ Cecil Castellucci, Jose Pimienta, Chris Schweizer, Brigette Findakly, Nathan Hale, Alison Wilgus. Room 26AB. 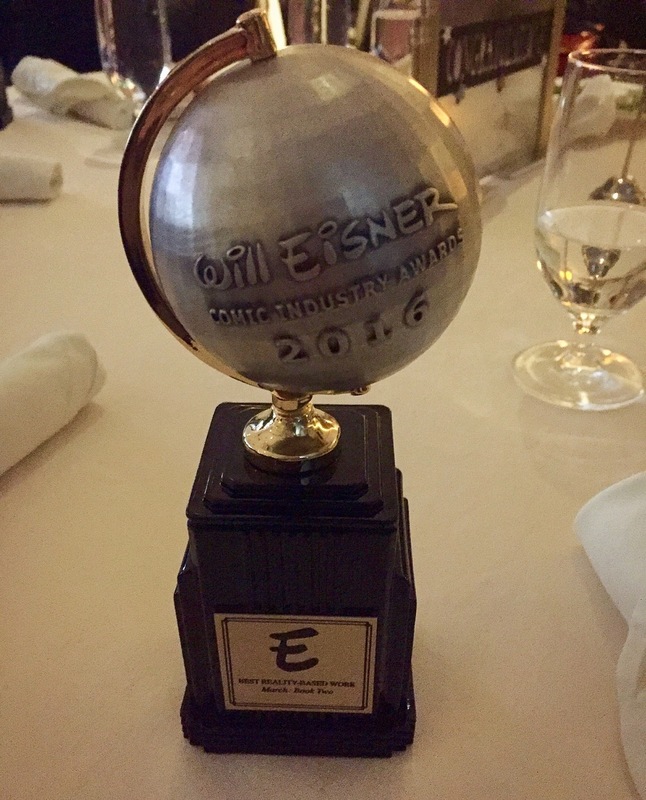 FRI 7/21, 8pm: Eisner Awards! MARCH: BOOK THREE is nominated for Best Reality-Based Work. SAT 7/22, 10-11 am: MARCH panel w/ John Lewis and Andrew Aydin. Room 23ABC. SAT 7/22, 11:15am-1:30pm: MARCH signing w/ John Lewis and Andrew Aydin. Top Shelf/IDW booth #2743. SUN 7/23, 12:15-1:45 pm: CBLDF Live Art Jam w/ Liz Suburbia, Sonny Liew, Chris Burnham-- artwork will be auctioned to benefit the CBLDF (here's your one chance to buy some original MARCH-related artwork!). Room 5AB. SUN 7/23, 2-4pm: I'm planning to be at the Top Shelf/IDW booth #2743 for most of the afternoon! MARCH: BOOK THREE WINS THE NATIONAL BOOK AWARD! Comics made it to the mountaintop. 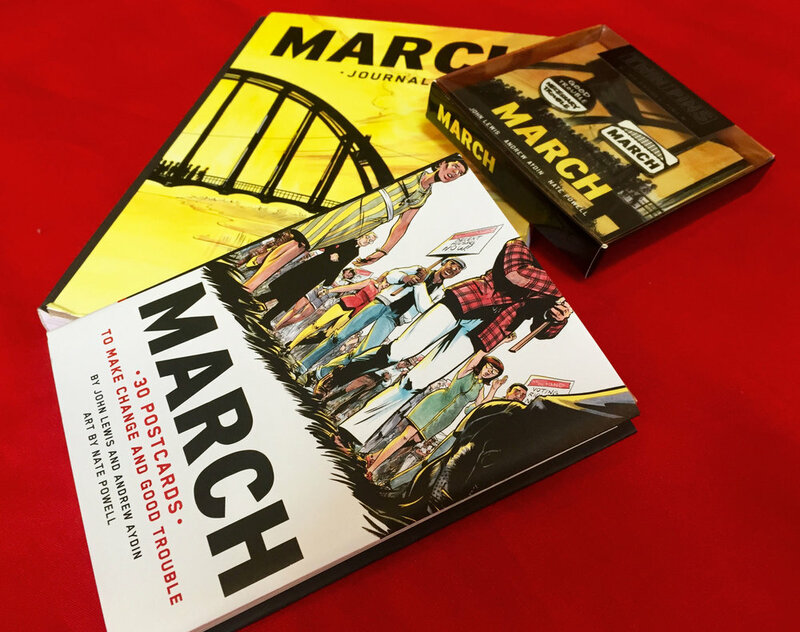 It's an immense honor to announce that March: Book Three is the winner of the 2016 National Book Award for Young People's Literature, making it the first graphic novel ever to do so. Here's Top Shelf's press release regarding the achievement. Comics have changed my life, and the lens through which I view and interact with the world, many times over. I'm proud to be the first cartoonist to break such a barrier, and we all want to welcome ALL readers to explore comics. Allow yourself to be transformed by them. Team MARCH on NPR's The Diane Rehm Show, Oct. 13th! I'll be discussing March on NPR's The Diane Rehm Show with my collaborators, Rep. John Lewis and Andrew Aydin at 11:00 am Eastern time. Tune in if you can, and spread the word-- thanks! MARCH is a National Book Award long-lister! We're all blown away to find that March: Book Three has made the long-list for the National Book Award in Young People's Literature! Here's Top Shelf's press release about it. Finalists will be announced October 13th, and the winner will be revealed November 16th. SMALL PRESS EXPO this weekend! It's time again for my favorite comics show of the year: Small Press Expo, held September 17-18 at the Marriott North Bethesda in (you guessed it) North Bethesda, MD! * Signing at Top Shelf booth, Saturday 1-3 pm. * Signing at Top Shelf booth, Saturday 5-6:30pm. * I'll be hosting the beloved Ignatz Awards Ceremony-- Saturday at 9:30pm! * Signing at Top Shelf booth, Sunday 1:30-3:30pm. MARCH: BOOK TWO wins an Eisner Award! We're all thrilled and honored for March: Book Two to've won the 2016 Eisner Award for Best Reality-Based Work! It was a deeply moving awards ceremony all around. Frankly, I don't see why people poo-poo the Eisner ceremony-- I always love being immersed in such a supportive community of folks, celebrating the hard work of their peers driven by ideas and the need to make something enduring. Go comics. March: Book Three debuted at San Diego Comic Con as well, closing out the trilogy. We had a fantastic panel Saturday morning, a massive children's march across the length of the convention center, and some packed signings all weekend. Thanks to everyone who came out, endured lines, and got a chance to say hey to The Man Himself, the great John Lewis. March: Book Three will be available everywhere on August 2nd-- we'll be discussing the book that evening on The Rachel Maddow Show on MSNBC, and will have a big signing at the Tribeca Barnes & Noble in Manhattan on August 3rd at 6:00 pm. See you there! Stay posted for more upcoming events, talks, and signings-- thank you! MARCH: BOOK THREE signed pre-orders w/ free ERIN TOBEY "Middlemaze" download! MARCH: BOOK THREE will be debuting at San Diego Comic Con on July 21st, and will be available everywhere on August 2nd! I'm taking orders NOW for signed mailorder copies directly from me-- and for the rest of the summer, ALL book orders will include a free digital download of the fantastic Erin Tobey's landmark Middlemaze album-- hands-down, the best album of 2016! You can also get a digital copy directly from Erin here, and order LP/cassette copies from Let's Pretend Records here. Book orders will be shipping out as soon as the books arrive from the printer in late July. Also debuting at SDCC will be the limited-edition MARCH trilogy slipcase edition-- I won't be selling any copies directly, but you can order them from Top Shelf/IDW here. Thanks, spread the word, and see you in San Diego! Stay tuned for an updated Team MARCH schedule of events and signings for the rest of the year. Bloomington IN-- events for MARCH coming up! Thurs Sept. 10th-- I'll be doing a presentation/discussion of my work, process, and lifelong journey through comics, with a focus on my collaboration on the March saga, at the Monroe County Public Library (Room 1B) from 7-8:30 pm. Enrollment is $65, BUT includes this presentation and its follow-up event on the 17th AND both the IU Auditorium event on the 21st and the private reception beforehand. Sign up ASAP if you wanna go! Sun Sept. 13th-- book discussion of March. 2:00 pm, Monroe County Public Library, Room 2B. Tues Sept. 15th-- I'll be on WFHB's "Interchange" from 6-7 pm, discussing March. Wed Sept. 16th-- Teen program/discussion of March-- FREE copies of March: Book One for all attendees! 3:30-5:00 pm, Monroe County Public Library. Thurs Sept. 17th-- I'll be doing a teen presentation/discussion of my work on March from 6-7 pm at the Monroe County Public Library. Thurs Sept. 17th-- Part Two of the ticketed discussion of March. 7:00- 8:30 pm at Monroe County Public Library. Mon Sept. 21st-- private reception/ meet-and-greet with Congressman John Lewis, Andrew Aydin, and me. 5:30-7:00 pm, Neal-Marshall Black Culture Center (275 N. Jordan Ave.). Tickets include premium reserved seating at the IU Auditorium presentation. Mon Sept. 21st-- John Lewis, Andrew Aydin, and I all discuss our work on March, as well as Congressman Lewis' incredible life path. FREE event-- you just gotta get the tickets! 7:30-9:00 pm, IU Auditorium. See you there! Please check out the MCPL's Power Of Words site for thorough information on any and all of these events. Thanks! MARCH is an Ignatz Award nominee! I'm honored to hear that March (written by John Lewis & Andrew Aydin, and drawn by me) is an Ignatz Award nominee for Outstanding Series! Voting will take place on Saturday, September 19th on-site at the Small Press Expo in North Bethesda, MD, and winners will be announced that evening. The Ignatz Awards are very special to me-- not only were they the first to put my work on the radar in many respects back in 2008, but their voting structure is perhaps the only in comincs to utilize a direct democratic method, and it's always interesting and exciting to see what's happening on the SPX show floor, in real time, as reflected in the awards. Thanks so much again-- it's an honor to be nominated for the coveted brick! San Diego Comic Con schedule & CBLDF artwork auction! I'm just about to join 97% of my cartoonist peeps in San Diego for Comic-Con International 2015-- I'll generally be found at Top Shelf's booth (#1721), signing copies of two new books-- You Don't Say and March: Book Two-- along with all the rest. THURS 7/9: at Top Shelf booth all day. FRI 7/10: at Top Shelf booth most of the day, plus discussing You Don't Say and March: Book Two at the Top Shelf spotlight panel from 12-1pm in Room 23ABC. *March panel (with John Lewis & Andrew Aydin). 10-11am, Room 23ABC. *March signing (with John Lewis & Andrew Aydin). 11:15am-1pm, Top Shelf booth (#1721). *March signing (with JL & AA). 3-4:30pm, IDW booth (#2743). *March signing (with JL & AA), 10:30-11:30am, Top Shelf booth. *March event off-site at Jacobs Center for Neighborhood Innovation (w/ JL & AA), 3:30-4:45pm. I'll also have this page from The Silence Of Our Friends (written by Mark Long & Jim Demonakos; First Second, 2012) up for auction to benefit the Comic Book Legal Defense Fund. It'll be Saturday, July 11th from 8-10pm at the Bayfront Hilton. Next week-- limited original artwork from all books for sale! Hi-- I'll be putting some pages of original artwork up for sale in the next few days in order to pay for hospital bills, car problems, and swim out of my debt dungeon with the IRS. This includes pages from SWALLOW ME WHOLE, ANY EMPIRE, WALKIE TALKIE/ SOUNDS OF YOUR NAME, PLEASE RELEASE/ YOU DON'T SAY, THE SILENCE OF OUR FRIENDS (w/ Mark Long & Jim Demonakos), THE YEAR OF THE BEASTS (w/ Cecil Castellucci), TWELVE REASONS TO DIE (w/ Ghostface Killah & Matthew Rosenberg), IN THE DARK (w/ Scott Snyder), THE LOST HERO (w/ Rick Riordan & Robert Venditti), SWEET TOOTH (w/ Jeff Lemire), and the only two pages from MARCH that will ever be available for sale in the forseeable future. Stay tuned-- Probably putting them up Monday, remaining available through the end of July. Thanks for your support and faith!